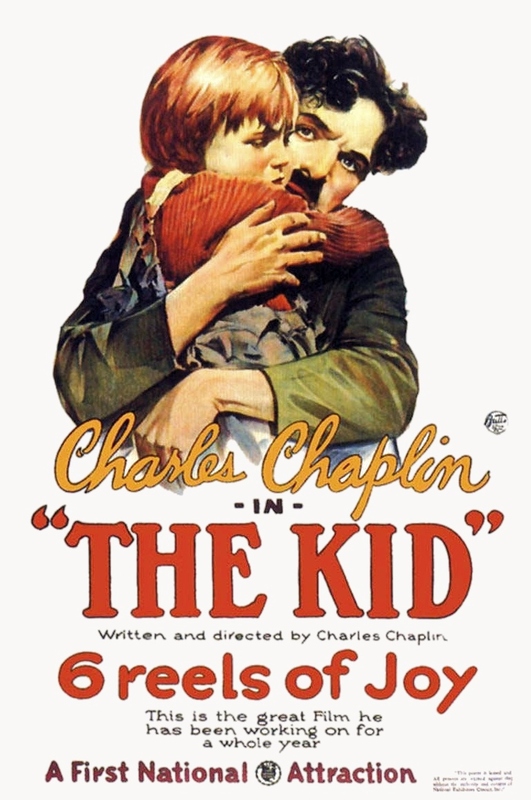 'The Kid' (1921) and other Chaplin films at the Wilton (N.H.) Town Hall Theatre on Sunday, Nov. 29 at 4:30 p.m. I'm looking forward to this Sunday's program of Charlie Chaplin comedies at the Wilton (N.H.) Town Hall Theatre, and not only because the films are great family entertainment. For many people with an interest in silent movies, including myself, Chaplin was the gateway drug into vintage cinema. Seeing his work for the first time (in my case, back in junior high school) sparked a lifelong interest in the mute world that he and so many others inhabited -- the world of stories told through gesture and action, but not burdened by the clutter and clatter of words, words, words. It was life stripped down to its barest essentials, bereft even of color in most cases. For me, this cleared the decks, resulting in an art form well adapted to tell stories in a way that life felt like to me -- a place of big emotions, intense feelings, and unforgettable experiences and people and places. The still photo from 'The Kid' that was used in the poster. If silent film is a grand hotel (hey, there are sillier analogies), then for me Chaplin was the bellhop who first welcomed me upon arrival, brought in my bags for me, and showed me to my room in this sprawling edifice, which I've been exploring ever since. So every Chaplin program is exciting to me in that it's possible what happened to me might happen to someone else. For that someone else, it might be the start of a long journey of exploration and discovery. 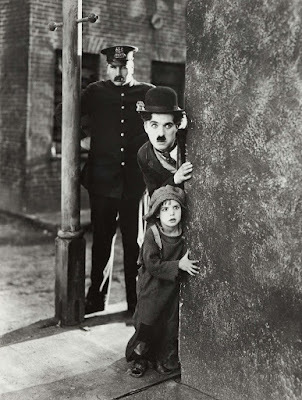 To join in the fun, come to the Town Hall Theatre in Wilton, N.H. on Sunday, Nov. 29, where we're running Chaplin's breakthrough feature 'The Kid' (1921) and several of his short comedies. More information is in the press release below. Speaking of which: we've gotten some good attention in the local media for this program, which is designed to give the whole family a way to wind up the holiday weekend in a fun way. So hoping for a big turnout. We'll see! Chaplin and co-star Jackie Coogan in 'The Kid' (1921). 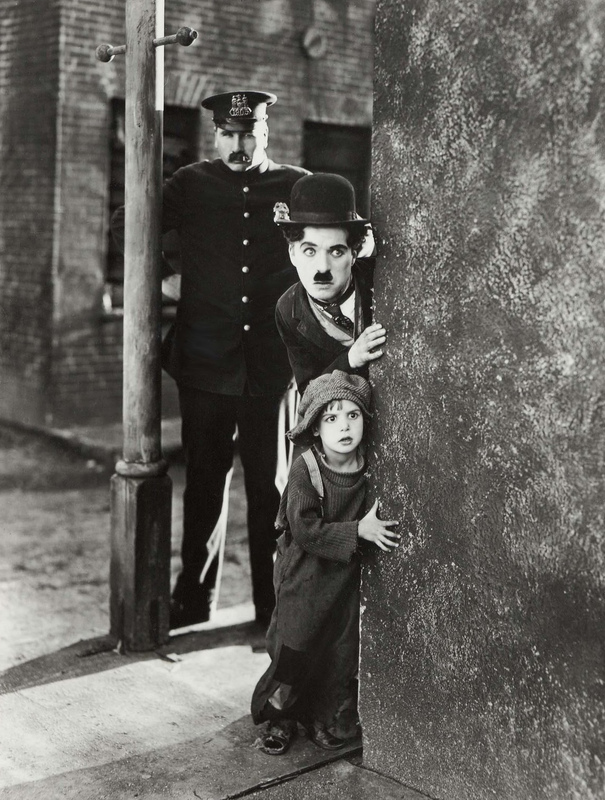 WILTON, N.H.—Silent film with live music returns to the Town Hall Theatre with a screening of Charlie Chaplin's classic comedy/drama 'The Kid' (1921) on Sunday, Nov. 29 at 4:30 p.m. The special program, which also includes several Chaplin short comedies, with be presented with live music by silent film accompanist Jeff Rapsis. The program, coming at the end of Thanksgiving weekend, is a chance for the whole family to get out to a fun event suitable for all ages. The Chaplin program continues the monthly series of silent film with live music at the Wilton Town Hall Theatre. The series provides local audiences the opportunity to experience silent film as it was intended to be shown: on the big screen, in restored prints, with live music, and with an audience. 'The Kid' will be preceded by several shorter Chaplin comedies made earlier in his career that helped establish his worldwide popularity. 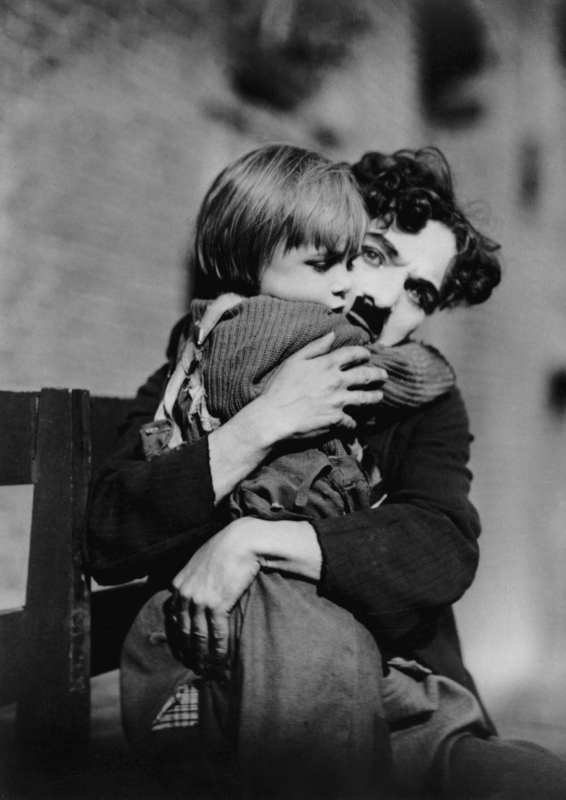 'The Kid' (1921) starring Charlie Chaplin and Jackie Coogan, will be screened with live music on Sunday, Nov. 29 at 4:30 p.m. at the Wilton Town Hall Theatre, 40 Main St., Wilton, N.H. Admission to the screening is free; a donation of $5 per person is suggested. This past weekend marked the birth of a new silent film series and the culmination of another. Here's a report. 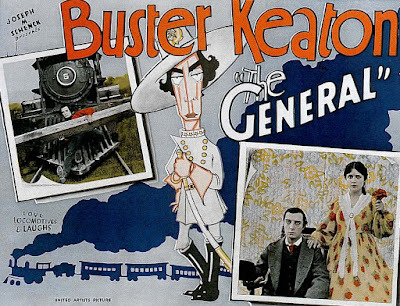 • Friday, Nov. 20 saw a strong turnout for Buster Keaton's 'The General' (1927), the opening show of a new series at Exeter (N.H.) Town Hall. 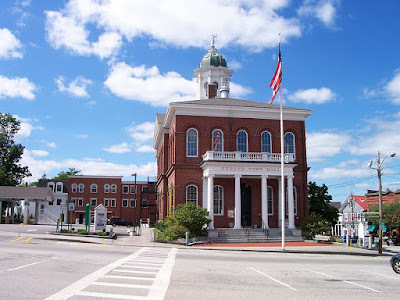 I've long wanted to do a silent film program in New Hampshire's Seacoast area. So when a chance came up to start one, I went for it. The chance came in the form of writer/educator Andrew Lapham Fersch, who runs the Penn Program, an innovative homeschool co-op for high-school-aged students based in Exeter. Andrew attended a screening last February at the Aeronaut Brewery in Somerville, Mass., where I sometimes do silent films. This particular screening almost didn't happen due to a blizzard that hit our area that day. But the show went on, and I'm glad it did, because Andrew introduced himself and asked about running a silent film for his kids in the Penn Program. So later that spring, I found myself setting up my keyboard and projector in the second-floor apartment in downtown Exeter that serves as the program's headquarters. 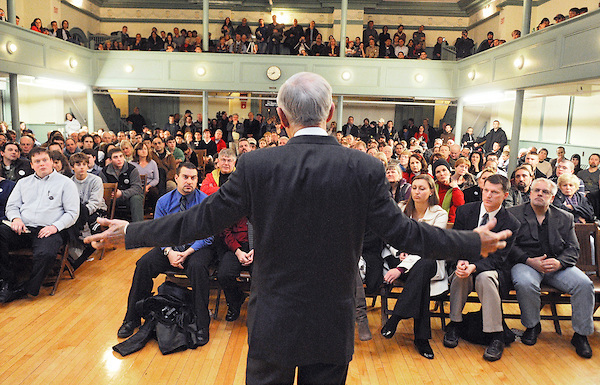 Students and family members enjoyed the show, which led to the idea of doing a series at nearby Exeter Town Hall. This would give Seacoast area residents a chance to see some great films with live music, and would also support the Penn Program. 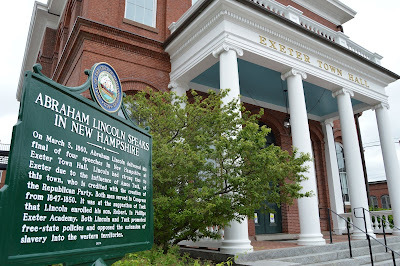 Exeter Town Hall, where Abraham Lincoln spoke in 1860 during his one trip to New Hampshire. So I went about renting the town hall, getting posters made up, and doing all the P.T. Barnum-like things you have to do to get something like this off the ground. 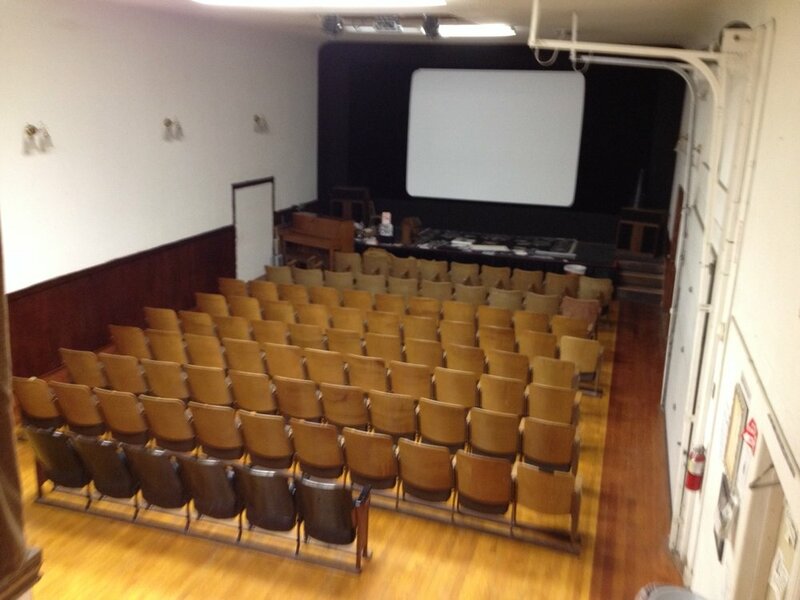 And lo, it all came to pass last Friday night, when a good-sized crowd turned out for a Buster Keaton program. We opened with the classic Keaton short 'One Week' as a sort of house-warming, and then ran 'The General' to much acclaim. The turnout surprised me, because other than posters and some word of mouth, we didn't get much publicity. Maybe I'm wearing my welcome out with the local press with all the screenings I do, but there was almost no coverage. So there I was, warning everyone beforehand that we shouldn't expect a big crowd at the first show, as these things take time to build and for people to find them. And then all these people start coming in. 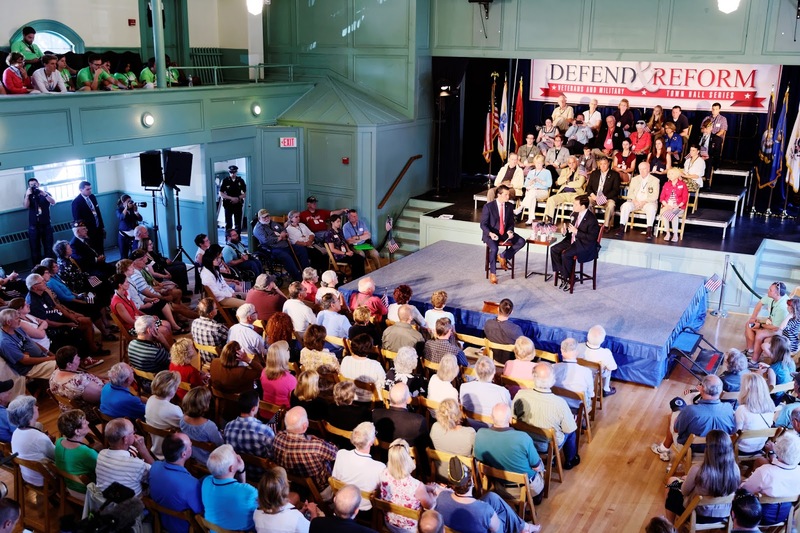 The Town Hall does not allow admission charges, so we could only suggest donations. I'm pleased to report that people were more than generous, making the effort worthwhile for the Penn Program right off the bat. For me, the highlight was seeing four of the students explain a little about the Penn Program and what they do in it. Among the projects are cycling across New Hampshire north to south, starting at the Canadian border and ending about 200 miles at the Mass. line. Hey, where was this program when I was in high school?! In addition to introducing Buster, I found myself making unplanned comments about the state of education in the United States, and how important it is to encourage young people to be creative. Maybe it's because Abraham Lincoln once spoke at Exeter Town Hall, or perhaps because it's often used for "Town Hall" gatherings by candidates in New Hampshire's first-in-the-nation presidential primary. Anyway, I found myself making a stump speech, saying the recent focus on science and math is important, but if students don't also develop their creativity, we won't get innovations and entrepreneurship that drive our economy and move us forward and underwrite our whole standard of living. Luckily for me, no food is allowed in Exeter Town Hall, so anyone hankering to throw anything lacked ammunition. So with the success of 'The General,' I'm looking forward to other screenings in Exeter: 'Metropolis' (1927) in January; a Harold Lloyd program in March, and 'The Big Parade' (1925) in May. • With 'The Four Horsemen of the Apocalypse' (1921), there was equal drama off-screen leading up to running the film on Sunday, Nov. 22 at the Somerville Theatre. The print that arrived at the theater just a few days before showtime turned out to the be 1962 remake starring Glenn Ford, not the silent original starring Rudolph Valentino. But thanks to the miracle of overnight shipping, the print of the correct version was delivered on Friday morning, allowing the show to go on. To me, this was the culmination of what we've been doing at Somerville for a few years now: showing silent films not just in 35mm, but recreating the whole experience that these films were designed for: the live music, the theater, the live audience. 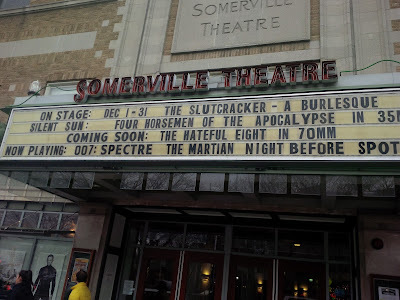 The Somerville Theatre's marquee as it appeared just before showtime, and just before I spilled coffee all over my suit by lifting up my phone to take a picture in the middle of a busy street. In that environment, many films come to life in surprising ways. Somehow, the comedy seems funnier, the drama seems more dramatic, and so on. And 'Four Horsemen' is one of those films. As a public domain film, it's freely available. And seen in one of the many blurry versions that circulate online on or DVD, it's ludicrous. But put on the screen the way it was intended to be shown, you can still be swept away by a movie that was one of the top box office sensations of the silent era. 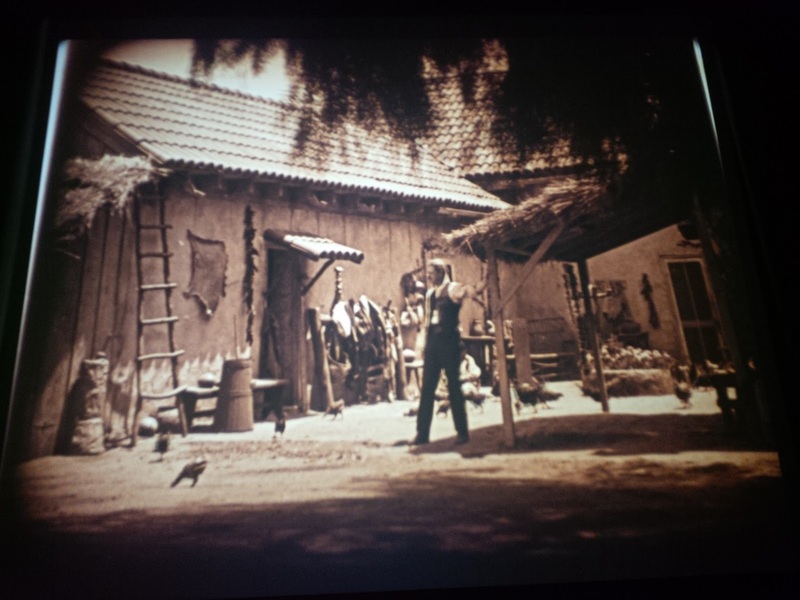 An image of the Somerville's screen taken while projectionist David Kornfeld was still adjusting the frame masking. So much I could say about this film, which to me is a kind of bridge between the early silent era and the more polished filmmaking of the 1920s. 1. It's known as a Rudy Valentino film, but 'Four Horsemen' is really more of an ensemble piece, with about a dozen performers playing important roles. And one of those actors is Alan Hale Sr., who will seem vaguely familiar to anyone who grew up watching reruns of 1960s television sit-coms. That's because Alan Hale Sr. begat Alan Hale Jr., who would achieve immortality by playing the Skipper on Gilligan's Island. And say again I say—the more silent film I see, the more I realize that so much of the DNA of pop culture to come can be found in it. Another screen shot, this one of the first appearance of the Skipper's father. 2. Regarding the "bridge" role that "Four Horsemen" played: I said D.W. Griffith's great epics of the teens, such as 'The Birth of a Nation' (1915) and 'Intolerance' (1916), showed audiences the promise of cinema. But 'Four Horsemen' was among the first movies to actually deliver on that promise. You can see this most vividly in the free incorporation of fantastic visual allegory to depict the four horsemen themselves. But this level of cinematic assurance and confidence is visible throughout the film, even in small moments such as "open door" shots. Several times, someone will open a door, only to reveal someone else in a natural place but framed by the door (and the movie frame itself) such as to draw our attention. It's film-making technique that holds up today. Even after nearly a century, it's so smooth you don't even notice it. To me, that adds a special level of excitement to 'The Four Horsemen of the Apocalypse,' even on top of its absorbing story and compelling characters. It's something that underpins my interest in silent film in general: you can feel the excitement of movie-makers as the discovered the potential of this new medium. There was no film school, and so you can sense the joy of discovery that I think is still evident in so many movies. Nowadays, we've seen it all. So I find it enormously compelling to revisit the era of genuine discovery—a time when we hadn't seen it all, but we were still discovering. 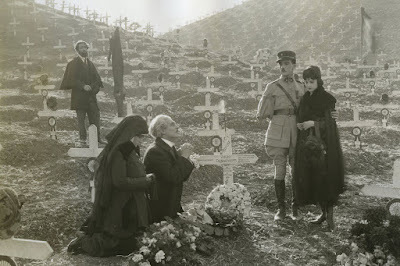 And I'm especially moved by the ending of this film, where the Tchernoff character (portrayed by Nigel de Brulier) stands amid endless graves of victims of the Great War and exclaims, "I knew them all." Wow! Way to go for a relatively minor role to put everything we've seen into perspective! To me, this celebrates the connectedness of all humanity past and present—and the idea that if somehow we work to achieve justice in the unknown future, it will help absolve humanity of all the sins of its past. That's a wonderful and powerful and all-embracing sentiment just by itself. But it also celebrates cinema's new-found ability to communicate such notions in a powerful way that no art form had never done before. "I knew them all!" to me celebrates the idea that we cannot unsee what the movies have shown us and everyone else in the theater with us, and in theaters around the world. In other words, we're all in this together, and there's no going back. So let's do everything we can to make the most of this amazing new thing, the motion picture camera. To me, when I see this sort of moment in silent cinema, I get a feeling that's probably related to what a parent feels when a child first rides a bike without help. It's pride, and also a sense of being part of something that's greater than both of us. Behold! Cinema without training wheels! If I ever compile these thoughts into some kind of book, I think know what the title would be: "Present at the Creation." And our screening of 'Four Horsemen' felt to me like the culmination of something that I've been learning about for some time now: creating music that helps bring an older film to life and doing it in a way that helps modern audiences accept it as something real and vital, rather than an antique from another era that has no chance to engage them. But the schedule continues, with more screenings in December, including my first-ever cobbled-together tour. Really! I'll be accompanying screenings in Cincinnati, Cleveland, and Toronto, Canada as part of my "Late Fall Mid-Western/International Silent Film Accompaniment Tour." Order your T-shirts today. Available only in XL or above because the tour's name won't fit on shirts any smaller. It's hard to outshine Rudolph Valentino, especially when he has the advantage of appearing on a backlit screen. Here's a challenge: I defy you not to be moved by the ending of this movie. And that's all I'll say, other than I urge you to attend a screening of 'Four Horsemen of the Apocalypse' (1921) at the Somerville Theatre in Somerville, Mass. on Sunday, Nov. 22 at 2 p.m. Yes, it's famous as Rudolph Valentino's break-through film, and also for starting a craze for the tango. But beyond that, I want you to discover this film on your own terms, as I did some time ago. And I hope you don't mind if I share some context that might help. 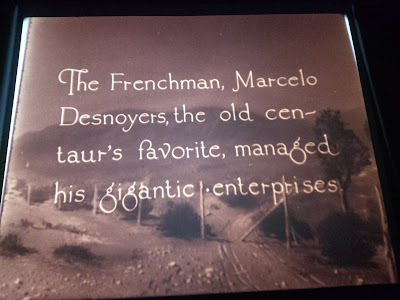 In scoring silent films, I am often struck by how fast the medium of the motion picture matured. It took less than 20 years for film to go from technically primitive one-reel dramas to sprawling big-budget spectacles such as 'Ben Hur' (1925) and 'Wings' (1927). To me, even some of the really important films of the 1910s, including big Griffith epics such as 'The Birth of a Nation' (1915), seem somewhat stage-bound and old-fashioned as motion pictures. But silents made just a few years later often have a polish and sheen and fluidity of technique that meet our expectations of cinema, even today. They look like real movies. So part of the joy of exploring the silent film archive is seeing movie-makers discover the possibilities of this new medium, often right before your eyes. And that brings us to 'Four Horsemen of the Apocalypse.' More than any other film I know, it serves as a bridge between early silent movies and the more mature Hollywood of the 1920s and beyond. I often wondered how movies got from Point A to Point B. Since becoming acquainted with 'Four Horsemen,' I now think of it as the missing link — the film that exploited the full range of cinema's potential. And it's success pulled movie-making to another level. Seen today, 'Four Horsemen' is full-blooded silent film story-telling in a movie language we still can understand. It's cinema without the training wheels. I intend to put everything I've learned into this screening, just as director Rex Ingram and his production team put everything they knew into making the movie. And as further proof of what a big deal this is turning into, we're actually bringing my mother down from New Hampshire to experience it. If she can make it, so can you! For more information about the screening, please check out the press release that's been pasted in below. Hope to see you on Sunday. SOMERVILLE, Mass.—An epic drama that launched the career of silent film heartthrob and megastar Rudolph Valentino will be shown in November at the Somerville Theater. 'The Four Horsemen of the Apocalypse' (1921), a multi-generational family saga that climaxes during World War I, will be screened in 35mm with live music on Sunday, Nov. 22 at 2 p.m. at the Somerville Theater, 55 Davis Square, Somerville, Mass. Admission to the screening, part of the Somerville Theatre's 'Silents, Please' series, is $15 per person, $12 students / seniors. 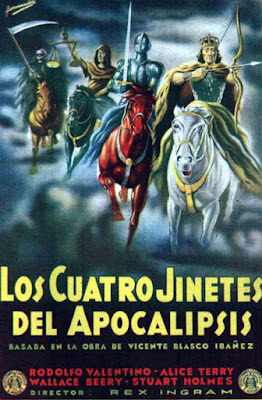 Based on a novel by Spanish author Vicente Blasco Ibañez, 'Four Horsemen of the Apocalypse' tells the story of an extended Argentine family with mixed ethnic background: one side is German, while the other is French. The family get drawn into World War I in far-off Europe, with members ending up on opposing sides. With brothers pitted against one another on the battlefield, the destruction of war changes lives forever. Directed by Rex Ingram for Metro Pictures (an ancestor of MGM studios), 'Four Horsemen' grew into a mammoth production: over $1 million was poured into it and more than 12,000 people were involved. The film was hugely successful at the box office, grossing nearly $5 million during its initial run, an enormous sum at the time. The film was notable as one of the first major Hollywood productions to include World War I (then known as the 'Great War') in its storyline, and also in that it did not glorify the recent conflict or look past the tragedy that it brought. Although Valentino dominates the film, other actors of note are featured. Alice Terry, the billed star as well as Ingram's wife, was a popular actress of her day. She would be cast in the next Ingram/Valentino flick rushed out in the same year before Rudy's jump to Paramount, The Conquering Power (1921). Alan Hale Sr. appears in a supporting role; he was perhaps best known as Errol Flynn's sidekick in numerous films, his role of Little John in several Robin Hood flicks, and as the father of Alan Hale, Jr., who played the Skipper on the television series Gilligan's Island. 'The Four Horsemen of the Apocalypse' was the brainchild of Metro screenwriter June Mathis, who went on to become one of the most powerful woman in early Hollywood, helping Valentino manage his career until his untimely death of peritonitis at age 31 in 1926. The film was remade as '4 Horsemen of the Apocalypse' in 1962, with the setting changed to World War II. In 1995, the silent version of 'The Four Horsemen of the Apocalypse' was selected for preservation in the United States National Film Registry by the Library of Congress as being "culturally, historically, or aesthetically significant." 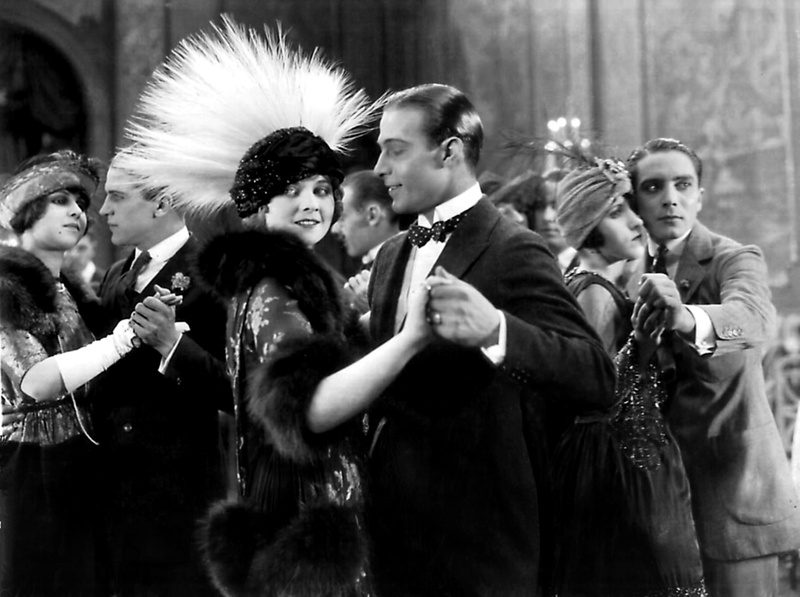 "This is a big sprawling drama, and a great chance to see Rudolph Valentino in the picture that launched his celebrity," said Jeff Rapsis, a New Hampshire-based silent film accompanist who will create live music for the screening. Rapsis will improvise live musical accompaniment during the show, using a digital synthesizer to recreate the sound of a full orchestra and other more exotic textures. 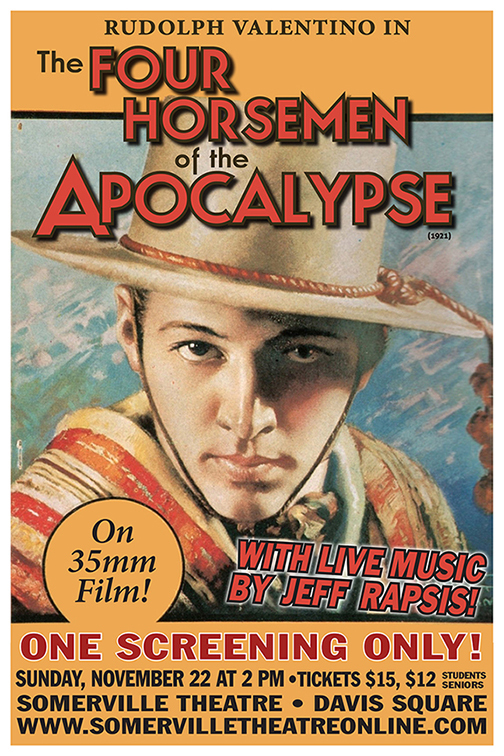 Rapsis will improvise a musical score for 'Four Horsemen of the Apocalypse' live as the film is screened. In creating accompaniment for classic cinema, Rapsis tries to bridge the gap between silent film and modern audiences. All movies in the Somerville Theater's 'Silents, Please' series were popular when first released, but are rarely screened today in a way that allows them to be seen at their best. In reviving silent films, the theater aims to show them as they were intended—in 35mm prints, on a large screen, with live music, and with an audience. ‘The Four Horsemen of the Apocalypse’ (1921) starring Rudolph Valentino will be shown with live music on Sunday, Nov. 22 at 2 p.m. at Somerville Theatre, 55 Davis Square, Somerville, Mass. Admission to the screening is $15 or $12 seniors/students. For more info, call (617) 625-5700 or visit www.somervilletheatreonline.com. For more info on the music, visit www.jeffrapsis.com. Keaton and his co-star in 'The General' (1926). I'm thrilled to announce a new silent film series in New Hampshire's Seacoast area, at the Exeter Town Hall in Exeter, N.H.
And our first screening is this Friday, Nov. 20 at 7 p.m., when we'll run Buster Keaton's 'The General' (1926) with live music by yours truly. Admission is free, with a suggested donation of $5 per person. All proceeds to support the Penn Program, a local homeschooling co-op program that emphasizes the arts and creativity for students of high school age. And I have to say, how odd to be running a film set during the Civil War in a building where Abraham Lincoln actually spoke prior to the 1860 presidential campaign! The exterior of Exeter Town Hall. Actually, I've wanted to do a series in this part of the state for a long time now, and for years I imagined it would be at a different location not far away: the Ioka Theater, also in downtown Exeter. This venerable venue, built in 1915 as a motion picture theater by the family of Louis B. Mayer (what a pedigree!) would have been great. The opening night attraction in 1915 was 'The Birth of a Nation' exactly a century ago this year. I had played a few shows there and it felt right—not a surprise, since silent films were once the main attraction. Alas, the theater shut down several years ago and remains in limbo. It's now doubtful the Ioka will ever reopen as a theater as that would require an expensive fire sprinkler system. What the interior of the Ioka looked like prior to closing in 2008. For awhile, community leaders tried to acquire the Ioka and reopen it as a non-for-profit community cultural center. To help rally support, I was brought in to do a silent film screening a few years ago. Since the Ioka itself was shuttered, our default venue was nearby Exeter Town Hall. The old Town Hall was erected in 1856, and of course was never designed as a movie venue. But a funny thing happened on the way to the 21st century. Built in the era before amplification, the old gal is blessed with wonderfully live acoustics that allow everyone to hear what's said no matter how quiet the speaker may be. 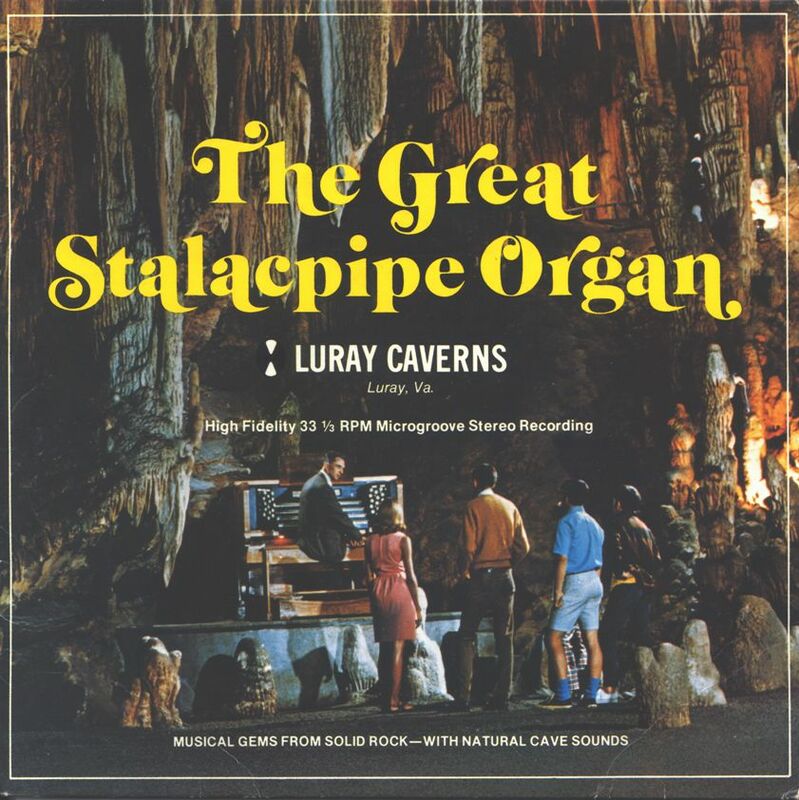 This makes it perfect for doing live music to accompany silent films, which I discovered during the screening to aid the campaign to reopen the Ioka. The Ioka never reopened, but I felt really blessed to have discovered another venue right down the street: the Exeter Town Hall. 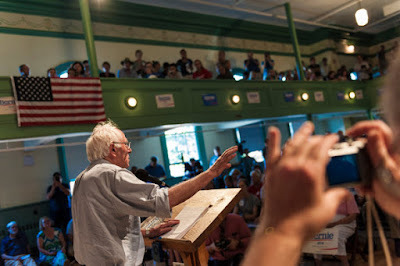 Even if you've never been to Exeter, you've probably seen the inside of the Town Hall thanks to media coverage of New Hampshire's first-in-the-nation Presidential Primary. Bernie Sanders at Exeter Town Hall. From 2012: Republican candidate John Huntsman at Exeter Town Hall. 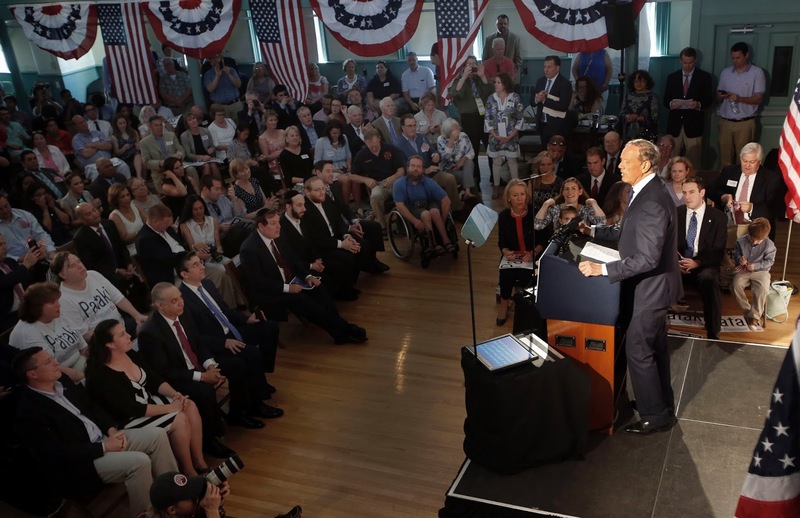 George Pataki at Exeter Town Hall. Marco Rubio at Exeter Town Hall. The series is in support of an innovative educational initiative that I first learned about earlier this year, when the gentleman running it approached me about running a silent film for his students. The gentleman is Andrew Lapham Fersch and the initiative is The Penn Program. Housed in downtown Exeter, the program provides an alternative homeschooling curriculum for students of high school age. Emphasis is placed on creativity, with the arts playing a big role. So after a private screening last spring, we came up with the idea of starting a silent film series at Exeter Town Hall as a worthy project for the kids and a fun thing for the community. Details in the press release that follows. See you there! An original poster for 'The General,' which we're screening on Friday, Nov. 20 at Exeter (N.H.) Town Hall. See for yourself with a screening of 'The General' (1926), one of Keaton's landmark feature films, at Exeter Town Hall, 9 Front St., Exeter, N.H. on Friday, Nov. 20 at 7 p.m. Admission is free. A free will donation of $5 per person is suggested, with all proceeds to support the Penn Program, a homeschool co-op based in Exeter designed to challenge and engage creative students of high school age. The screening, which is entertainment for the whole family, will include live music performed by N.H.-based silent film accompanist Jeff Rapsis. 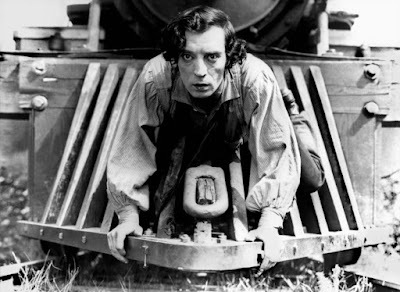 Keaton, stealing another train, races north in pursuit behind enemy lines. Can he rescue his girl? And can he steal his locomotive and make it back to warn of a coming Northern attack? It's also regarded as one of Hollywood's great train films, with much of the action occurring on or around moving steam locomotives. "Keaton's 'The General' is a great mix of comedy, history, pantomime, and movement, all presented in the timeless format of silent film," Rapsis said. By screening 'The General' at Exeter Town Hall, local audiences will get a chance to experience silent film as it was meant to be seen—in a high quality print, on a large screen, with live music, and with an audience. "All those elements are important parts of the silent film experience," said Rapsis, who improvises a movie's musical score live as it screens. "Recreate those conditions, and the classics of early Hollywood leap back to life in ways that can still move audiences today." Keaton, along with Charlie Chaplin and Harold Lloyd, stands today as one of the silent screen's three great clowns. Some critics regard Keaton as the best of all; Roger Ebert wrote in 2002 that "in an extraordinary period from 1920 to 1929, (Keaton) worked without interruption on a series of films that make him, arguably, the greatest actor-director in the history of the movies." 'The General' is the first in a series of silent film screenings to benefit the Penn Program, a homeschool co-op based in Exeter designed to challenge and engage creative students of high school age. The program, launched by educator and writer Andrew Lapham Fersch in 2012, seeks to explore new methods of education. The Penn Program emphasizes active involvement in a wide range of artistic and creative activities ranging from video production to stand-up comedy. Under Fersch's direction, the program operates in downtown Exeter, enrolling students from several area towns. The Penn Program seeks to create a new model for integrating the arts into education, with the goal of fostering creativity, originality, hard work, dedication, kindness, and a spirit of giving. "We felt presenting a silent film series was a great way to reach out and introduce ourselves to the community while bringing people together," Fersch said. "We're all eager to celebrate the creativity of early Hollywood in Exeter Town Hall, which is a great space, and we're doubly excited to be able to bring the community together to enjoy such a talented musician and wonderful movie." • Friday, Jan. 29, 2016, 7 p.m.: 'Metropolis' (1927); Exeter Town Hall, 9 Front St., Exeter, N.H. German director Fritz Lang's amazing epic about a futuristic society where an educated elite enjoys life in a glittering city, all supported by colonies of workers forced to live deep underground. A film that set new standards for visual design and changed movies forever! • Friday, March 25, 2016, 7 p.m.: 'Grandma's Boy' (1922) starring Harold Lloyd; Exeter Town Hall, 9 Front St., Exeter, N.H. A cowardly young man must learn to conquer his fears before dealing with a larger menace to his community. Riotous small town comedy that helped propel Harold Lloyd into the most popular movie comedian of the 1920s. • Friday, May 20, 2016, 7 p.m.: 'The Big Parade' (1925); Exeter Town Hall, 9 Front St, Exeter, N.H. MGM's landmark film, a sweeping drama about U.S. doughboys facing down death in the World War I trenches. Starring John Gilbert and directed by King Vidor, an epic that set the standard for generations of war movies to come. 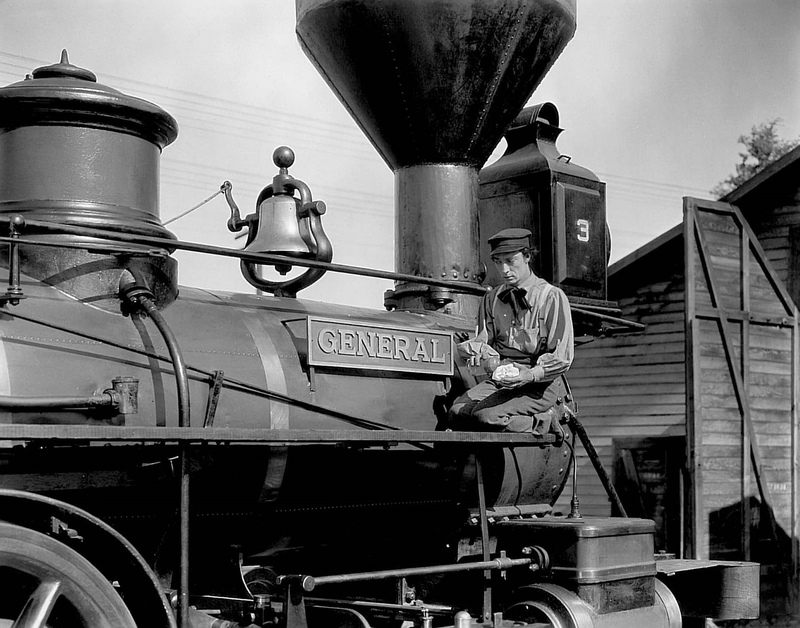 Buster Keaton's 'The General' (1926) will be shown on Friday, Nov. 20 at 7 p.m. at Exeter Town Hall, 9 Front St., Exeter, N.H. A free will donation of $5 per person is suggested, with all proceeds to support the Penn Program. For more information about the Penn Program, visit www.facebook.com/thepennprogram. For more information on the screening, visit www.jeffrapsis.com. Vintage lobby card for 'So's Your Old Man' (1926) starring W.C. Fields. On Saturday afternoon, I'll fly down to Washington, D.C., then drive about an hour south into the Virginia countryside. Why? To accompany a pair of W.C. Fields silent features, of course! 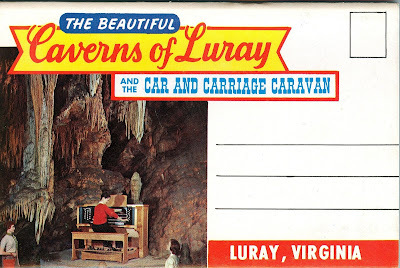 Did you think I was visiting Luray Caverns? Although that might make sense, as Luray Caverns is home to the "Great Stalacpipe Organ," something I remember from stacks of brochures we'd collect during family roadtrips. Hey, has anyone ever considered a silent film showing down there? Titles at the Packard Center Theater in Culpeper, Va. are 'So's Your Old Man' (1926) and 'Running Wild' (1927); show time is Saturday, Nov. 14 at 7:30 p.m. Thanks to Rob Stone and his colleagues at the Library of Congress Packard Center for inviting me again to accompany a program. I went down there earlier this year to accompany a Gloria Swanson program, and then again for the most recent "Mostly Lost" festival of unidentified silent material. It's a real privilege to work with folks such as Rob and Mike Mashon and so many others at the Library of Congress who work to preserve our nation's media history and heritage. I see what they do, and feel a little bit better about filing my federal income tax return. And because much of what they curate was pop culture in its day, there's occasionally some overlap with celebrities, who sometimes donate their archives to the Library of Congress. 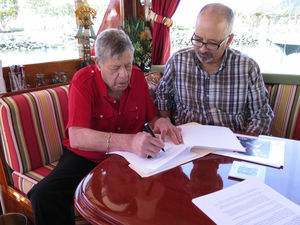 Earlier this year, Rob was the point man in the Packard Center's acquisition of the personal archive of Jerry Lewis, who donated his personal film collection, including home movies and rare outtakes. The process culminated in Lewis visiting Culpeper last month (darn, just missed him), to tour the Packard Center and do a performance at the State Theatre, a restored venue in town. Lewis with Rob Stone, not Dean Martin. Although the actual Library of Congress is in downtown D.C., the sprawling Packard Campus is where physical film and audio materials are curated, cataloged, and stored. And in the case of film, it's where rare prints are shown to the public. 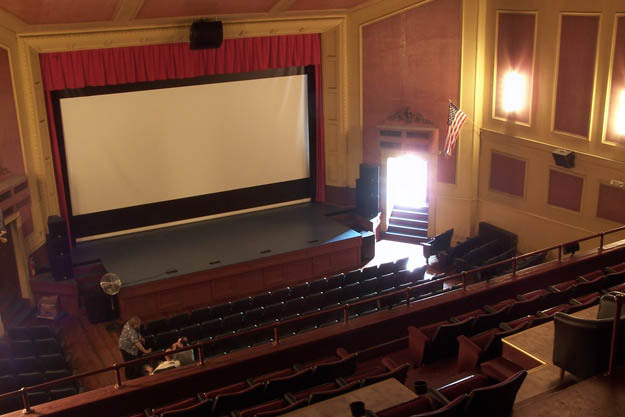 The nicely appointed Packard Theater runs a heavy schedule of vintage screenings of a wide range of titles. Saturday night's double-bill is part of a weekend Fields program, portions of which will be introduced by the great gentleman's granddaughter, Dr. Harriet Fields. If she's on hand for the silents, expect me to attempt to get her to pose for a snapshot. I mother used to say: never pass up a chance to be photographed with vintage film royalty. I've done both of these films before, and I've found the Fields silents really hold up well. Although he wasn't a truly cinematic silent clown such as Chaplin or Lloyd, his films were popular, and they still get big laughs today. I'm not sure how much of this is due to our familiarity with the character he played later on in talkies, in which we actually hear his unforgettable delivery. If you've ever heard Fields talk, it's hard not to imagine his nasal inflections in his silent pictures when reading title cards. Ahhh, yaaassss. So if you're in the D.C. area, come out to Culpeper to check out some real comedy, as opposed to what goes on elsewhere in places like, say, Congress. 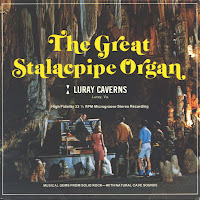 And if you get an early start, you might have time to hear the Great Stalacpipe Organ at Luray Caverns. starring elephants—hey, is this a theme? Okay, since getting back from San Francisco on Monday, the music hasn't stopped. Just the other night (Tuesday, Nov. 10), I accompanied a screening of 'My Friend from India,' an obscure 1927 comedy starring Franklin Pangborn. The show was part of a monthly series at the Manchester (N.H.) City Library where I challenge myself to do music for films I've never heard of before. 'My Friend from India' certainly fit that category. I knew of Franklin Pangborn from his many character roles later on. But I had no idea he's had "leading man" status, if only briefly, in earlier days—and in what turned out to be a farce comedy, no less. We had about 30 people on hand and reaction was muted but steady—not exactly a sensational rediscovery, but worth putting on the screen to find out. Me, I thought it was surprisingly enjoyable, although I'm not expecting a big Pangborn resurgence to occur anytime soon. India, by the way, is home to elephants. And next up is a program devoted to them. Tonight (Thursday, Nov. 12) at the Flying Monkey in Plymouth, N.H., I'm accompanying two films with performing pachyderms in lead roles. First up is 'Soul of the Beast' (1923), a melodrama starring the gorgeous Madge Bellamy, ham actor Noah Beery, a cast of dozens, and "Oscar" the Elephant in his one big screen role. This is hands-down the silliest silent film I've ever encountered, and I'm really looking forward to experiencing it with audience reaction. Hope they're not selling old fruit and vegetables at the concession stand in the lobby! I discovered this title when planning out an "animal" series two summers ago at the Wilton (N.H.) Town Hall Theatre. It was a hit, although definitely of the "so bad it's good" school of entertainment. But then we straighten out and fly right with 'Chang' (1927), a superb film shot on location in the jungles of Siam, which nowadays goes by the name of Thailand. This semi-documentary (in which elephants play a leading role) includes absorbing footage of local village life in that part of the world. 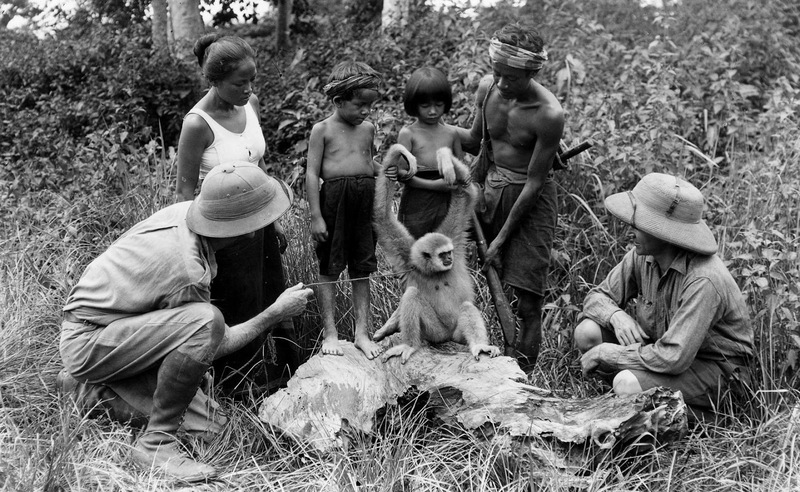 But filmmakers Merian C. Cooper and Ernest B. Schoedsack were winners in the sense that they wrested a film from the jungle that showed the potential for the movies to take audiences to places they would otherwise never see in person. 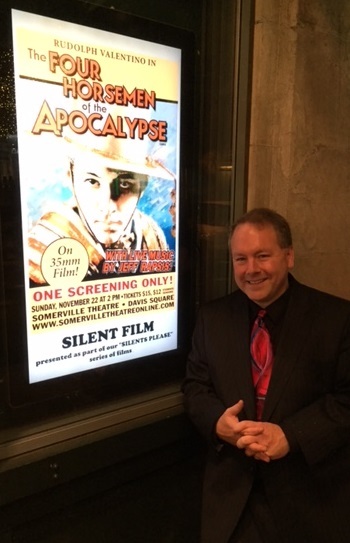 I hope to see you in person at tonight's screening. And bring some peanuts to feed the elephants! Below is the text of a press release about both films. PLYMOUTH, N.H. — They couldn't speak, but that was no handicap in the silent film era. They were the great animal stars of early Hollywood: dogs, horses, and even elephants, who were as popular as any human performer when the movies were young. See for yourself how animal stars helped establish the popularity of motion pictures as the Flying Monkey Moviehouse and Performance Center screens a double feature of two silent films featuring early Hollywood's biggest stars of all—enormous elephants in leading roles. Both films give performing pachyderms ample opportunity to display their dramatic range on camera. 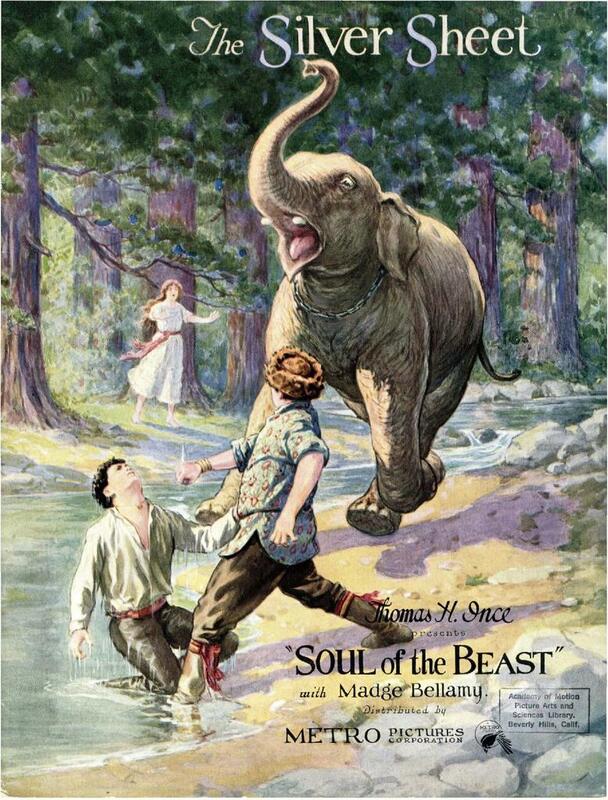 'Soul of the Beast' (1923) stars Oscar the Elephant, who accompanies a circus runaway fleeing her mean stepfather. Together, they astonish the rustic inhabitants of rural Quebec. 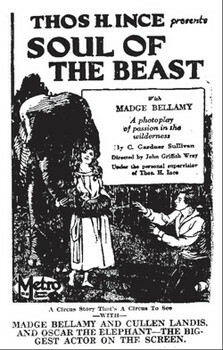 Co-starring in this fast-paced North Woods melodrama are well-known human actors Madge Bellamy and Noah Beery. A photo taken during the shooting of 'Chang' (1927). No one in pith helmets actually appears on screen. In 'Chang, A Drama of the Wilderness' (1927), shot on location in rural Siam (now Thailand), a native family in the back country battles the jungle for survival. Chang includes an abundance of footage captured documentary-style by the filmmakers on location in the jungles of Southeast Asia. The film was nominated for the Academy Award for Unique and Artistic Production at the first Academy Awards in 1929, the only year when that award was presented. Live music for both screenings will be performed by silent film accompanist Jeff Rapsis. Rapsis will improvise the music, creating it live as each film is running. "When the score gets made up on the spot, it creates a special energy that's an important part of the silent film experience," said Rapsis, who uses a digital synthesizer to recreate the texture of a full orchestra for the accompaniment." Rapsis acknowledged that audiences may be surprised to learn that elephants could play leading roles in early pictures. But movies starring animals of all types were a staple of early Hollywood. "At their heart, these pictures capitalized on people's love of animals to produce great entertainment," Rapsis said. "They still work, and really do come to life when shown in a theater with live music and an audience." "Also, because of the passage of time, they're perhaps even more interesting today than they were when first released," Rapsis said. 'Soul of the Beast' (1923) and 'Chang' (1927) will be shown on Thursday, Nov. 12 at 6:30 p.m. at the Flying Monkey Moviehouse and Performance Center, 39 South Main St., Plymouth, N.H. Admission $10 per person. For more info, call (603) 536-2551 or visit www.flyingmonkeynh.com. What the Oculus headset looks like. Sometimes I feel my head is about to explode. Yesterday morning I visited the "Oculus Room" at Facebook headquarters in Menlo Park, Callif., where I tried out an advanced virtual reality system due on the market next year. And then that evening, I sat down at an acoustic piano and played live music for a silent film program at the Niles Essanay Silent Film Museum, across the Bay in Niles, Calif. So in the span of a few hours, I experienced the latest in cutting edge visual entertainment, and then labored to help revive a form of visual pop culture from a century ago. Help! Too much jarring contrast! What I actually did was time travel. Or at least it seemed like I did, which, by the standards of virtual reality, is the same thing. But this is what happens when you come to Silicon Valley to accompany a silent film program, and your brother-in-law works at Facebook. The shifts of perspective are as glaring as anything H.G. Wells might have imagined. Oculus is the big new thing, at least in the Facebook eco-system. Hence my visit to "the Oculus Room," where employees can sample a prototype of the system. To do this, I donned a set of black headgear, which felt like what I wore when sparring at the boxing gym, except the eyes were covered with goggles. And I got to experience ("see" isn't the right word) Oculus via a demo narrated by a man with a British accent who told me the technology promised unparalleled freedom to satisfy mankind's urge to create and explore new worlds. I have to say, Oculus was technically impressive! No matter which way I turned, the view matched what you'd expect. Moving forward through a junkyard full of rusting old tanks, I could turn around and in the distance see the backside of tanks I'd passed by long ago. As I understand it, Facebook has a team working hard to find industrial and business applications for the Oculus platform. But the focus for now is on gaming and entertainment possibilities, where new worlds to explore are always sought. But one thing brought me up short. At one point, the demo brought me to the back of a large, well-appointed movie theater. Rows of plush red seats were arrayed before me, all facing a good-sized curtained screen. The narrator promised me the ability to experience movie-theater quality entertainment in any way I pleased, at any time and from any angle or in any configuration. Wow! But I couldn't help notice that all those seats were empty. So what about that crucial part of cinema: the shared audience experience? Most people today see the "audience experience" as a negative: people talking, blocking your view, looking at their cell phones, etc. But in many ways, the shared audience reaction is crucial to a movie's full impact. That's certainly the case in silent cinema, when the only way to see a film was in a theater with an audience. Filmmakers back then knew that, and often timed their pace and editing to accommodate the reaction of a large audience. 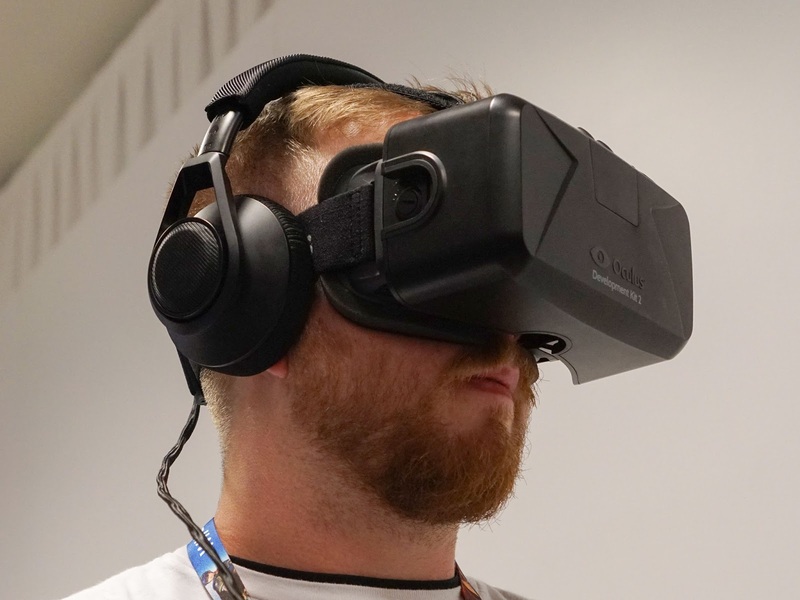 So what does virtual reality have to replace or augment the audience experience? Put another way: What's the point of seeing a movie in a big theater if all those seats are empty? I asked my brother-in-law, and the best we could come up with was an option that allowed a user to populate the virtual theater with other people. And because it's virtual, the user could control some or all aspects of the audience, as he or she wishes. So I could fill the theater with figures from history, for example. Imagine watching Charlie Chaplin's 'The Great Dictator' sitting next to Adolf Hitler! Or maybe have everyone in the theater weigh 250 pounds or more, which would make me feel svelte. Hey, I'm beginning to like virtual reality. Well, we'll see if Mark Zuckerberg incorporates any of these features before Oculus is ready for prime time. As it is, I have seen the future, and it's exciting, although slightly blurry and color shifted. Later, as we walked around Facebook's enormous new headquarters building, the little clip from 'Metropolis' got me thinking. And the more I looked around, the more I realized that they way Zuckerberg runs the place has its ancestry in, yes, silent film. Consider: like a lot of high profile Silicon Valley companies, Facebook's campus is one-third office and two-thirds playground. Work stations are out in the open, games and free food abound, and art is everywhere. And it occurred to me: employees are encouraged to collaborate, brainstorm, create, and problem-solve in ways that mirror the way Buster Keaton made his great films in the 1920s. At the Keaton studio, they'd often make up big chunks of a film through improvisation on the set. As Buster often said, there was no way to plan out business in advance. Some of his best comedy would come from working with the physical set-up in place. And if they got into a situation that no one knew how to resolve, they'd do something that people found surprising even then. They'd knock off and go play baseball! And they'd continue to play ball, inning after inning, until someone came up with a way for Buster to get out of a jam, or for the story to move forward, or whatever else that had stumped them. Buster seems to have instinctively known that by letting his team play, the end result would be creativity that could not happen any other way. The result, of course, was a unique body of work that pushed the art of filmmaking into new places and has stood the test of time. And I have to believe a lot of the special qualities of Keaton's great silents came from the loose "let's see what happens" way in which they were often made. Of course careful planning and logistics went into many of Keaton's legendary sequences. That locomotive crashing through the burning bridge in 'The General' was anything but an accident, although it appears to be one on screen. But once Keaton signed with MGM and was forced to make pictures with a script, the quality of his work changed. And gone was the innovative filmmaker who compulsively explored the nature of a new toy called the motion picture camera, and the medium of film itself. So in Silicon Valley, it seems that Zuckerberg and so many other tech titans are using that same sensibility to foster innovation in the digital age. Play can unleash unexpected creativity, which is often where the real leaps forward happen. It worked for Keaton, and it seems to work for the tech innovators of Silicon Valley, too. And the realization of things like this---that how a filmmaker such as Keaton worked in the 1920s anticipated crucial underpinnings of industrial tech innovation today---is why my head feels ready to explode. But it hasn't---not yet, anyway. And so, armed with a renewed sense of relevance for silent film, off I went to the Niles Essanay Museum to create music for Rockliffe Fellowes and Anna Q. Nilsson in 'Regeneration' (1915), a film so old that people in it drink beer from buckets hauled home from the local tavern. A hundred years ago, that was how they did virtual reality. 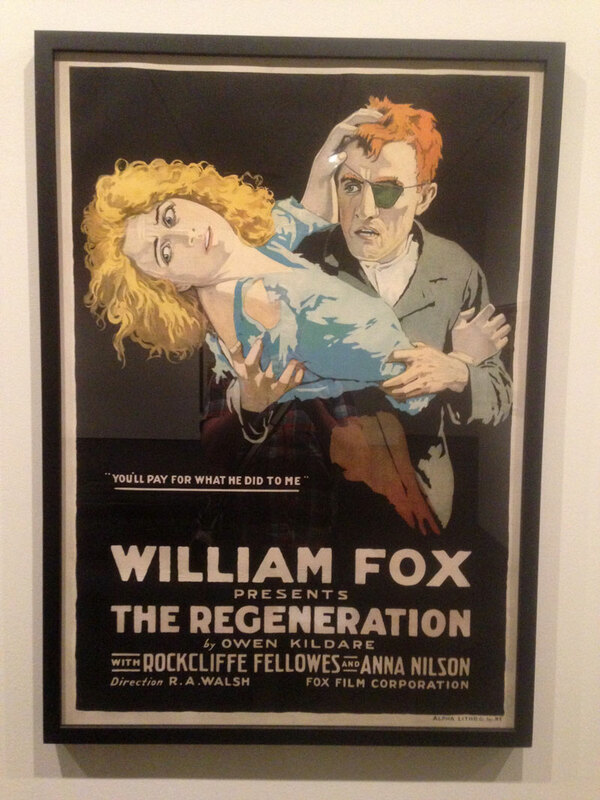 A poster for 'Regeneration' (1915), which I'm accompanying on Saturday, Nov. 7 at the Niles Essanay Silent Film Museum in Fremont, Calif. In the next few weeks, I'll be accompanying silent film screenings in several far-flung locations. Before listing the details, let me say thanks in advance to everyone at all these venues. People have been very generous in their encouragement of what I do, in the form of providing opportunities to create music for silent film screenings in so many different places. To mention just a few names: Dorothy Bradley of the Niles Essanay Silent Film Museum, Rob Stone of the Library of Congress Packard Center, Maggie Perrino at the Carnegie Center in Cincinnati, John Ewing at the Cleveland Cinematheque, and Alicia Fletcher at the Revue Cinema in Toronto, Canada. The interior of the Niles screening room, which looks very much as it would have when it was opened as an Edison Theater in 1913. 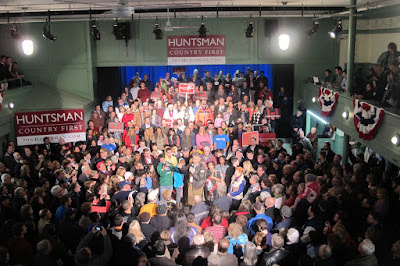 I'm humbled by this support. I'm also thrilled because sitting in the dark and making music to moving images has emerged as a way for me to keep my sanity. I'm a junkie and I need my fix. Actually, It's my public creative outlet and now my compulsion, and at this point (more than 100 shows this year) I don't know what I'd do without it. I sometimes think of silent film accompaniment a "wellness activity." It really should be covered by Blue Cross/Blue Shield. So to all who've invited me to perform—thank you! In addition to giving me a chance to practice this unusual craft, you're saving me thousands on therapy. I didn't actually plan this out. The long-distance screenings (outside my New England base) just sort of piled up one after another. But now I look at the calendar to find myself heading out all over the place. And I think of back to high school when I felt studying music wasn't the right plan for me. I never dreamed that one day I'd be traveling the country making music this way. • Saturday, Nov. 7, 7:30 p.m.: 'Regeneration' (1915) starring Rockcliffe Fellowes and Anna Q. Nilsson; the Edison Theatre at the Niles Essanay Silent Film Museum, 37417 Niles Boulevard, Niles, Calif. A gem of a film directed by Raoul Walsh near the start of his career depicting the grim life of the streets in New York City. Early feature-length Fox drama thought lost for many years but rediscovered in the 1970s. Wonderful vintage Edison theater from 1913 now fully restored; shows silent films with live music every week. Suggested admission $5 per person for members, $7 for "not yet members." • Saturday, Nov. 14, 7:30 p.m.: 'Running Wild' (1927) and 'So's Your Old Man' (1926) starring W.C. Fields; Packard Campus Theater, National Audio-Visual Conservation Center, Library of Congress Packard Campus, 19053 Mount Pony Road, Culpeper, Va; http://www.loc.gov/avconservation/theater/schedule.html. A double feature of Fields silent comedy. In 'Running Wild,' meek Elmer Finch (W.C. Fields), browbeaten both at home and at work, volunteers to subject himself to a vaudeville hypnotist. While under the mesmerizing spell, his personality undergoes a dramatic and aggressive transformation. 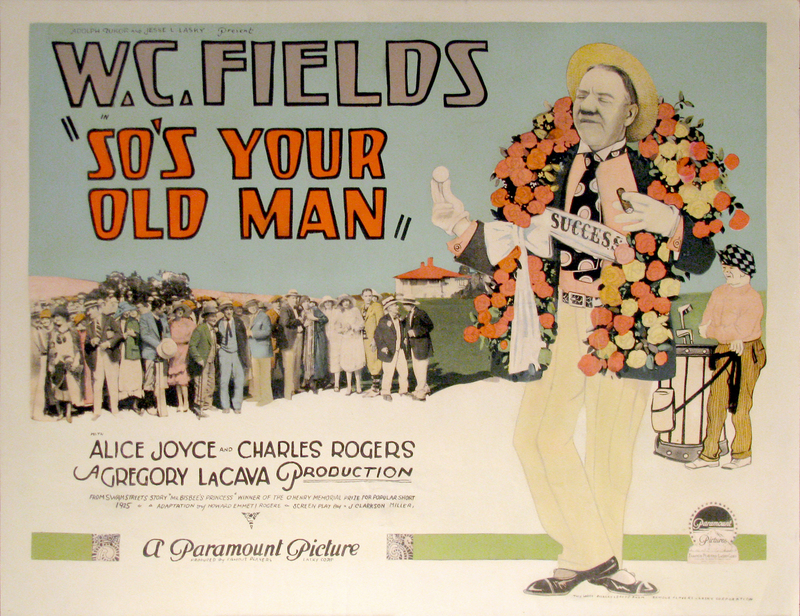 In 'So's Your Old Man' (1926), Fields plays inventor Samuel Bisbee, who is considered a vulgarian by the town's elite. His road to financial success takes many hilarious detours. Free and open to the public, but children 12 younger must be accompanied by an adult. Open seating is on a “first come, first served” basis. After Thanksgiving comes my first-ever bona fide "tour." I drive out to Cincinnati for a program at the Carnegie Center in Covington, Kentucky (just across the Ohio River from Cincinnati), then bomb up to Cleveland for two days of screenings at the Cleveland Cinematheque. The next day, it's my international debut at Toronto's Revue Cinema. • Thursday, Dec. 10, 7:30 p.m., 'Holiday Silent Film Program'; Silent film program at The Carnegie Visual and Performing Arts Center, 1028 Scott Boulevard, Covington, Kentucky. (859) 491-2030; www.thecarnegie.com. On the program: a selection of short films, and then the great Mary Pickford feature 'Tess of the Storm Country' (1922), which has an ending that's perfect for the holidays. • Friday, Dec. 11, 7:30 p.m., 'Three's A Crowd' (1927) starring Harry Langdon plus 'Big Business' (1929) starring Stan Laurel, Oliver Hardy; Cinematheque at the Cleveland Institute of Art, 11610 Euclid Ave., Cleveland, Ohio; (216) 421-7450. Holiday-themed program of silent film with live accompaniment. 'Three’s a Crowd' (shown in 35mm) was the directorial debut of Harry Langdon, the baby-faced comedian considered the fourth great clown (after Chaplin, Keaton, and Harold Lloyd) of the American silent screen. Special admission $12; members, CIA I.D. holders, age 25 & under $9; no passes, twofers, or radio winners. • Saturday, Dec. 12, 6:55 p.m., 'Passing Fancy' (1933) directed by Yasujiro Ozu; Cinematheque at the Cleveland Institute of Art, 11610 Euclid Ave., Cleveland, Ohio; (216) 421-7450. Winner of Japan’s Kinema Junpo Award for best film of 1933, 'Passing Fancy' is a touching tale of a poor, widowed, illiterate, middle-aged (but warm-hearted) brewery worker, his feisty 8-year-old son whom he is raising alone, and a young woman who comes between them. One of Yasujiro Ozu’s last—and best—silent films. With Chishu Ryu. Subtitles, shown in 35mm. Special admission $12; members, CIA I.D. holders, age 25 & under $9; no passes, twofers, or radio winners. And after that, I drive back home to continue to procrastinate about holiday cards and shopping.